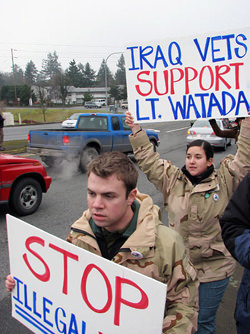 FORT LEWIS, WA (February 8, 2007) – In a complex and confusing turn of events yesterday, Army lead prosecutor Captain Scott Van Sweringen reluctantly requested, and was granted a mistrial in the case of First Lieutenant Ehren K. Watada, the first military officer to publicly refuse to fight in Iraq. 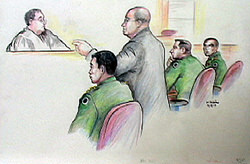 In summation, the day after the prosecution rested a poorly presented case against Lt. Watada for “missing movement” to Iraq and two counts of “conduct unbecoming an officer and a gentleman,” the prosecution then requested—over the strenuous objections of Lt. Watada’s defense team—in essence a “do over.” Lieutenant Colonel Judge John Head then agreed to the “do over.” The basis for which, and the judge’s motives, may likely be a matter of debate for some time. Lt. Watada's civilian lawyer Eric Seitz later explained, “The mistrial is very likely to have the consequence of ending this case because a retrial would be a case of double jeopardy based on the military rules for courts martial and applicable case law.” Should the Army proceed with a second trial, Seitz said he would seek dismissal of the charges with prejudice so they could not be again filed. “I do not expect a retrial to ever occur,” stated Seitz. Army Captain Mark Kim, Lt. Watada’s appointed military defense lawyer, noted that he agreed with Seitz’s conclusions. 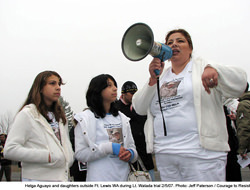 Vigils continue outside the gates of Ft. Lewis and a "victory rally" is planned for Friday to demand that the Army discharge Lt. Watada and drop all charges against him. Supporters in the Ft. Lewis area will gather outside the gates of the Army base at Exit 119 from 4pm-7pm for banner and sign-holding followed by a candlelight vigil with speakers and music. (more info) Plan one in your community! On Monday, the first day of the court martial, over a thousand people and giant puppets rallied at the gates of Fort Lewis, Washington in support of Lt. Ehren Watada. Formed for the occasion, the “Tacoma Puppetistas” visually dominated the mass rally by putting the war on trial via huge puppet theater. Meanwhile Iraq Veterans Against the War and families of military resisters led chants and marches from rallies in a nearby park to the base gates. On Fort Lewis, supporters of Lt. Watada lined up at the visitors station beginning at 5:00 am in order to gain entry to the court proceedings. Many were turned away, but about 50 civilians were eventually allowed to view the proceedings from a viewing room with an audio/video feed. during Watada court martial 2/5/07. Also: Tuesday (Day 2) photos from outside the courtroom, and at the gates of Fort Lewis .